A community planning project was proposed for the Lower east Side of New York City. The site was a several block area located at the southern end of Manhattan, leveled and abandoned off South Street at Rutgers Slip. It is contiguous to the lower East Side community which, at that point in time, had a wealth of educational, religious and social organizations that could be tapped as resources. 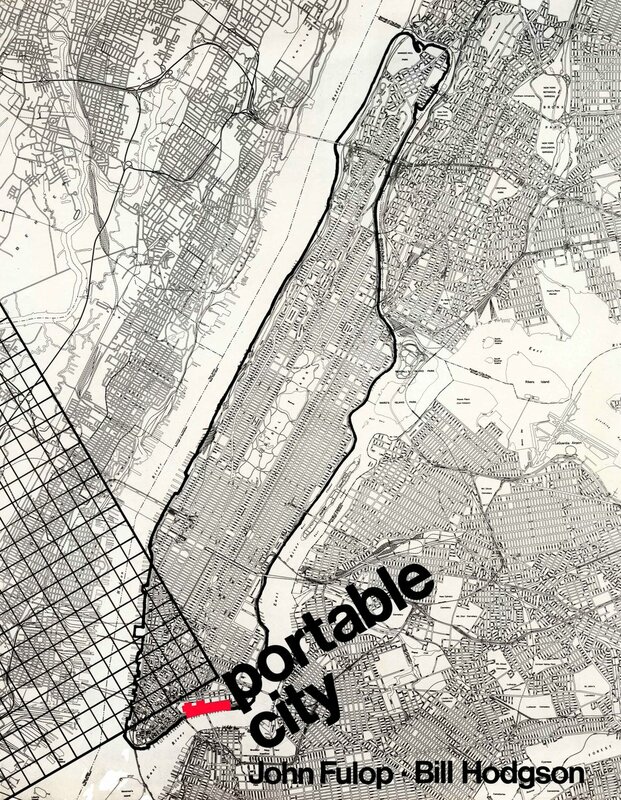 Portable City was envisioned as a temporary extension of the existing lower east side community housed in multi-use portable structures. It would highlight the problems caused by "slum clearance" planning concepts, which destroy a part of the fabric of an existing neighborhood in order to build low income housing. 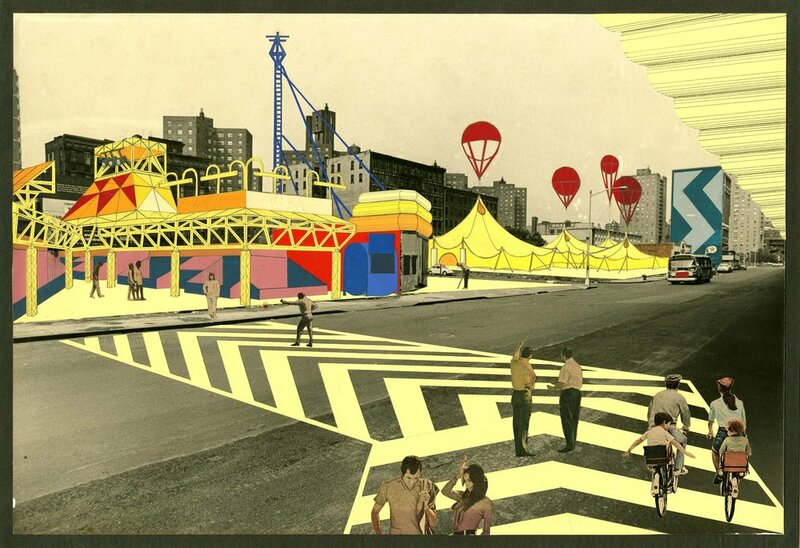 My experience designing portable theater structures for the "Movies in the Park" projects for NYC were part of the concept, as the proposal consisted of setting up workshops in the community to build various portable structures. Organizations like the Henry Street Settlement House, etc. were to be involved to help teach teens and young people in general, to fabricate these structures over the course of a year. The idea was to create a "Town Hall", a "Theater Space", a "Cafe", a small urban park, etc., which would be populated temporarily by artists, artisans and members of the workshops that created the structures. 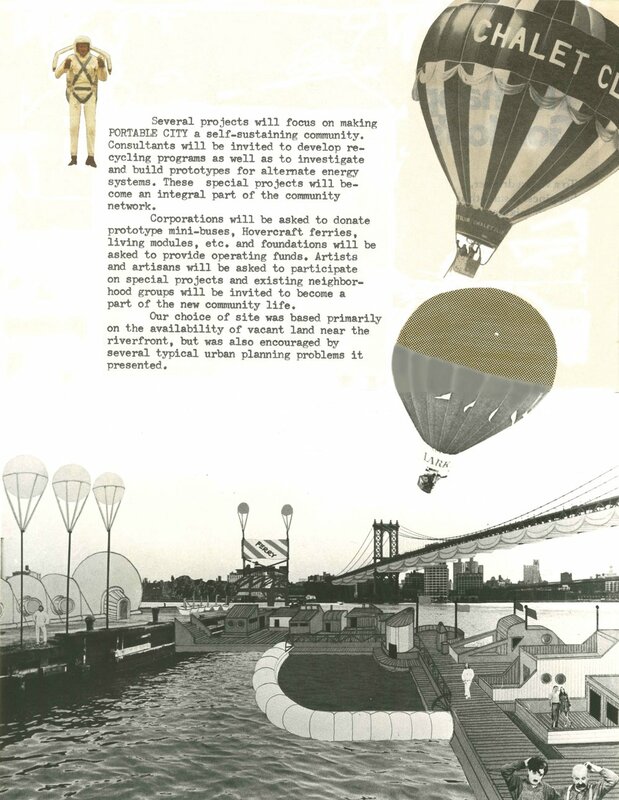 The various types of finished structures would occupy the site over the summer months and be connected by TV to a "Portable World" show at the uptown Museum of Contemporary Crafts. Local TV coverage was planned to have illustrated the vitality of such neighborhood activism and hopefully given the city second thoughts about any plan to build another complex of "Low Income Project" buildings. Funding for the complete design didn't materialize quickly enough, but the concept was nevertheless included in the Portable World exhibit at the MCC.